All eyes were focused on the Royal Wedding last month, but how did websites in the UK use the big occasion to their advantage? Exclusive research from theEword's MD Al Mackin reveals exactly which sites' search engine optimisation strategies enjoyed a happy marriage with the big day, and which were left standing at the altar. The official Royal Wedding website comes out on top, perhaps unsurprisingly. It has achieved this position in no small part through using the primary keyword 'Royal Wedding' in the site URL. 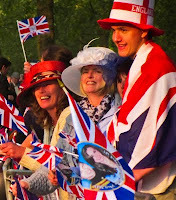 This technique has also been used by unofficial sites theroyalweddingwilliamkate.com and royalwedding.yahoo.com, which gained ranking positions 4 and 8 respectively. What's interesting to note is how both have achieved high positions despite having a relatively low number of inbound links. Google clearly still sees the inclusion of the keyword in the URL as a big factor when presenting search results. 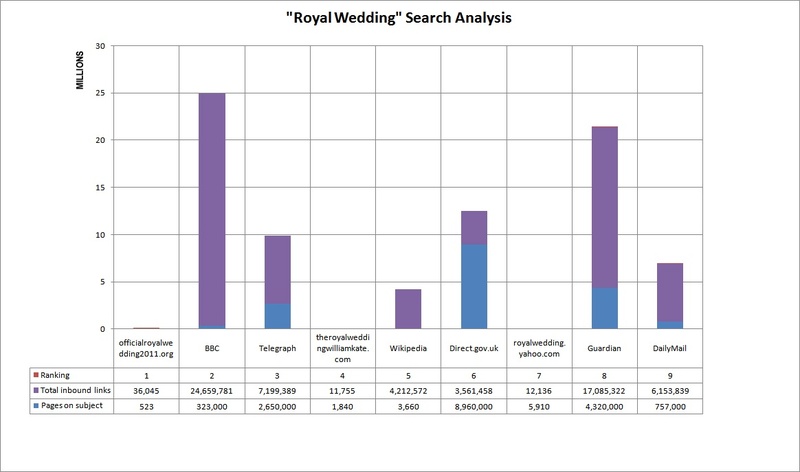 What's more, the chart above shows that the official Royal Wedding site ranked first despite coming up short against larger rivals in almost every category. We can safely assume that the sheer amount of content relating to the wedding saw Google look very favourably upon it. One big surprise in the data is the fairly poor showing among newspaper websites. The Telegraph, the Guardian and the Daily Mail take positions 3, 9 and 10. The Guardian particularly could have made gains here when its inbound links (second only to the BBC among the top ten sites) and total pages are taken into account. Considering the success of the sites with the primary keyword contained in the URL, it's fair to conclude the Guardian did not place quite as much emphasis on placing the primary keyword in the URLs of its news coverage. A good level of quality among its inbound links along with a large volume of related pages saw the Telegraph rank highly, a factor that also contributed to the success of Direct.gov.uk. This is primarily the same reason why the BBC – with a whopping 24 million links – ranks second. The losers are the Sun, the Times and the Mirror. The Sun, particularly, had up to 1 million more inbound links than the websites in places 11 to 14, so should be disappointed with its poor showing here. So what can be taken from these figures? Mainly that being an 'authority' site with inbound links garners good search results. Of course, as is the case with Londonist.com (one of the weakest sites on the list), flukes do still occur, but the importance of link-building when developing a strong SEO presence cannot be denied. However, despite claims to the contrary, Google clearly still places a significant premium on URLs containing relevant keywords. Even after the recent Google Panda update, it would appear the fundamentals of SEO best practice remain largely the same.